This large, elegant and exceptionally collectible Peach Onyx Marble Gemstone Egg was mined, sculpted and richly polished by hand to a high gloss finish in Pakistan � the home of the highest quality and most beautiful Onyx Marble in the world. Highly sought after by both beginning and serious gemstone egg collectors and home decorators alike, it is an excellent example of this how this lovely, semi-precious gemstone grows deep within Mother Earth. 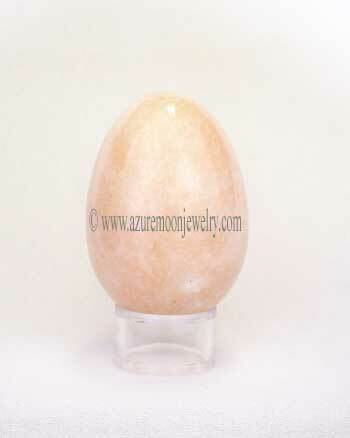 The beautiful and fine soft peachy pink crystalline structure sparkles ever so slightly in the light and the tiny white inclusions and delicate fading from darker to light and back again make this marvelous Peach Onyx Marble Gemstone Egg truly one of a kind. Honestly, the photograph just doesn't due this Peach Onyx Marble Gemstone Egg justice! The color is much like a peachy Angel Skin Coral, or a pale Orange Dreamsicle and the fine crystalline structure and minute details that are visible to the naked eye are very difficult to capture in a photograph - it has to be seen in person to be truly appreciated! 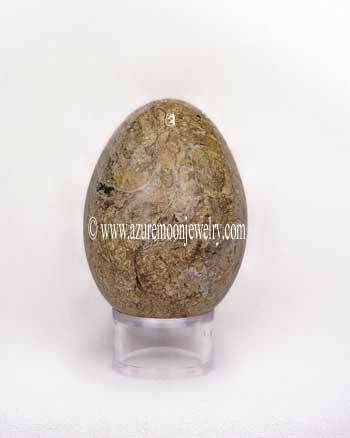 This Peach Marble Onyx Gemstone Egg is the size of a duck's egg and measures approximately 2 7/8� L - 2� W and weighs 262 grams or 1310 carats. The crystal clear acrylic display stand is included.